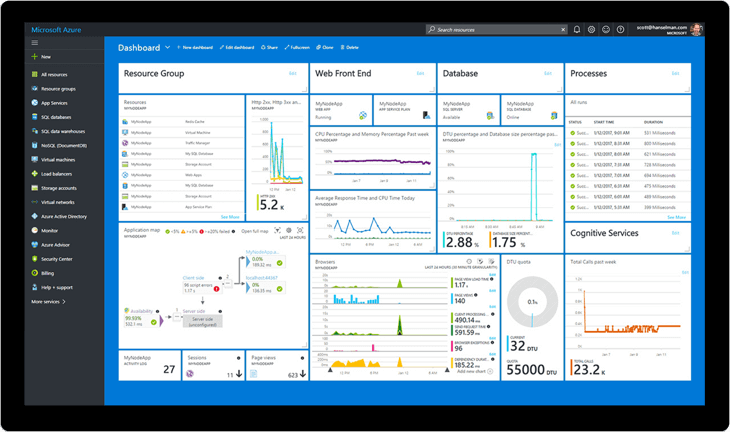 What is Azure App Service and how can your company can benefit from using it? Let us help you create the mobile app of your deams, and lauch it on the market asap. Mobile App Development Here and Now. What is Azure App Service? First of all, if you have been using Azure Website in the past, you are probably asking yourself what exactly is Azure App Service? Ok. Let’s find out how we got from websites to App Service and what it is. So, Azure App Service is a Platform(PaaS) created by Microsoft Azure. Most of all, it allows you to create web and mobile apps that are targeted for virtually any platform or device. And if you are asking yourself how is that even possible, well the answer is pretty simple. Azure lets you test your apps on custom made virtual machines on your demand. For this reason, just name the resources you want to use, and you’re good to go.Generally speaking, what Azure App Service wants to bring on the table is integrating multiple components like websites, mobile apps, APIs, and Business logic process and so on into a single solution. If you knew the previous service having been comprised of Websites and Azure Mobile Services, you might be shouting with joy right now. In addition, the new service has a ton of new capabilities especially for automating business logic and API stuff. In fact, it’s all in a single place, like it should be. In short,I really like the way you can test your apps with dedicated or fully managed virtual machines. Cool, right? In this blog post we are going to find out what is Azure App Service and what it offers. Also, Azure App Service allows you to develop web apps on both Windows and Linux platform. For instance, these can be scaled at any time in any growth stage of your company’s life-cycle. Of course, you can enjoy high integration and availability, load balancing and support for multiple programming languages. Secondly, this service basically allows you to deploy both web and mobile apps using a single backend solution. Truly, it is super easy to start a new project or connect to the cloud services you are already using. Templates and APIs along with great support will surely accelerate and make your workflow processes quite easier. Thus, you don’t have to worry about Security, Scalability, and Compliance. App Service is already offering these at an Enterprise Grade level. Moreover, Azure App Service lets you create easily API in the cloud and integrate them with Azure Services. Also, it lets you connect any APIs that you already own. However, it should be using any of the following programming languages: .NET, PHP, Node.js, Java, or Python. What’s even cool about this service is that you can make changes and redirect traffic to the updated version instantly without losing juice. In conclusion, this means virtually no downtime at all. Moreover, azure is always keeping the authentication quite simple. Just a few settings and you can keep your APIs secure through the Azure Active Directory, social network sign-on or OAuth. Most noteworthy, the best part about it is that you don’t have to get your hands dirty to do it. In other words, Azure will always take care of your sign-on SDSs to always keep them up to date. In addition, what I personally like about this service is that you can build mobile apps on any platform for any device and test it on the cloud. Probably social integration is something quite odd today. Yet, how about scaling your app to support million users automatically? Furthermore, you don’t have to worry about security. Azure Active Directory is managing this aspect for you. Next. Mobile Apps Service helps you develop cross-platform and native apps for iOS, Android, Windows, or Mac. You can then easily authenticate users with Active Directory. Likewise, you can create app that can work offline or apps that sync. Storing data locally on your apps increases your app responsiveness. On the other hand, with Notification Hubs, you can easily send millions of push notifications. Also, you don’t have to worry about auto scaling at all. The global network of Azure Data Centers allows you to easily reach any user in new location. Especially relevant, Azure App Service also has a great feature called Logic Apps. This feature basically helps you easily create awesome integrations. It is built with ready connectors to help you reduce stress and any friction when trying to connect with different solutions. Each day new connectors are being added to Azure Marketplace. A few cool things you might want to use with Logic Apps are services like Machine Learning and Cognitive Services. Seems like, it has never been easier before to make informed decisions that have a great impact on your business. As a result, you don’t even have to change the infrastructure you are already using. Therefore, you may simply connect and use data from the cloud to on-premises.